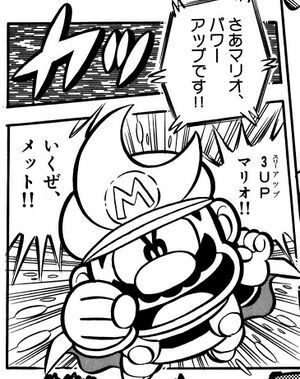 Moon Mario is a form Mario assumes in Super Mario-Kun. It is gained when Mario collects a 3-Up Moon, which grants him this form rather than granting him three extra lives as in Super Mario World. In this form, Mario gains a crescent moon on his cap, which he can detach and throw at enemies like a boomerang. This page was last edited on October 14, 2018, at 20:36.